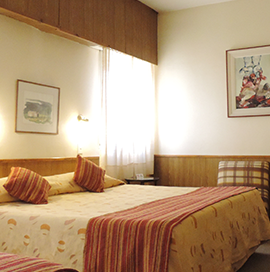 Hotel Galicia is located in Trelew, just 100 meters from Plaza Independencia and 250 meters from the Paleontological Museum. We are committed to making your stay in a hotel with history more comfortable. For that reason, to our experience in the hospitality industry since 1947, we have strengthened it with the integral reform initiated in 1999, which continues to the present with the rest of our facilities. Whether your trip is for pleasure or business, we hope to satisfy your expectations of accommodation, with the warmth and attention typical of Patagonia. 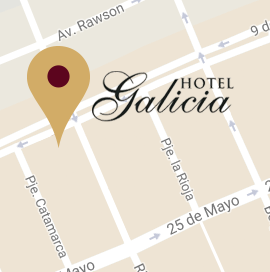 Copyright Hotel Galicia. All rights reserved.